Anonymous, Netherlandish School, c. 1500. Albrecht Durer, oil on panel, 1511, Kunsthistorisches Museum, Vienna, Austria. Crispijn de Passe the elder, engraving, England, 1623. El Greco, oil on canvas, 1577-1579, Museo del Prado, Madrid, Spain. Viktor Vasnetsov, 1907, State Tretyakov Gallery, Moscow, Russia. Gregorio Vasquez de Arce y Ceballos, oil in canvas, circa 1680, Colombian National Museum. Jacopo da Pontormo, oil on canvas, 1525, Galleria dell'Academia, Florence, Italy. José de Ribera, oil on canvas, c. 1635, Museo del Prado, Madrid, Spain. Lucas Cranach the Elder, c.1516 - 1518, The Paula Modersohn-Becker Museum, Bremen, Germany. Lucas Cranach the Elder, illustration to a book by Adam von Fulda, woodcut, 1512, British Museum. Lucas Cranach the Elder, oil on panel, c.1515, Kunsthalle, Bremen, Germany. Lucas Cranach the Elder, oil on wood, Museum der Bildenden Kunste, Leipzig, Germany. Peter Paul Rubens, oil on canvas, c.1620-22, Norton Simon Art Foundation. Roman School, The Holy Trinity, oil on canvas, 18th century, private collection. Sandro Botticelli, oil on wood, 1491-93, Courtauld Institute Galleries of London. Raphael, fresco, 1509-10 Apostolic Palace, Vatican City. Tikon Filatyev, 1700, Russian icon. 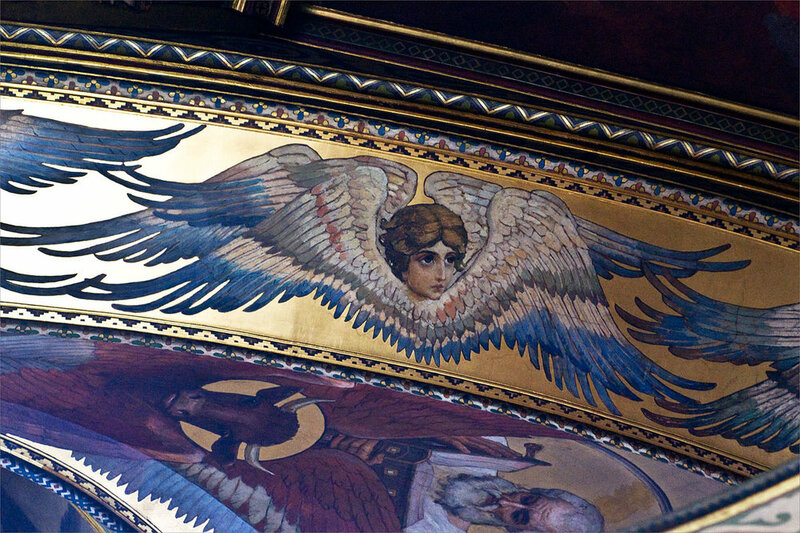 Victor Vasnetsov, fresco at the Vladimir Cathedral in Kyiv. Victor Vasnetsov, sketch for a fresco at Vladimir Cathedral in Kyiv. The Monad incarnate: Pieter de Grebber, God Inviting Christ to Sit on the Throne at His Right Hand, 1645 (detail), Museum Catharijneconvent Utrecht. In the Hermetic Emerald Tablet (in Sir Isaac Newton’s translation, c. 1680) it is written: "And as all things have been & arose from one by the mediation of one: so all things have their birth from this one thing by adaptation". Pythagoras meant that the whole universe generated from the divine Monad, and he ascribed divine qualities to the numbers immediately following it: 2, 3, 4 and their sum (1+2+3+4), 10. To him, numbers were living forces, almost creatures, which also coincides with the Kabbalistic views ascribing active essences to letters and numbers. Geometrical qualities of 1, 2, 3, and 4. - the quaterniad, or intellectual science = a form of perfection, the principle of law and order (Solid). Finally, the Divine Tetractys comes as the sum of these four, being the ultimate symbol of perfection. The very word is equivalent in its deeper meaning to the sacred Judaic Tetragrammaton (the ineffable name of God) YHWH (יהוה). Pythagorean initiates even swore by the tetractys to preserve secrecy and fidelity: so sacred was this Figure, and simultaneously Divine Principle, to them. Illustration of a harmonic series, i.e. a series of overtones, on the note C, from Leonard Bernstein’s 1st lecture from theseries “The Unanswered Question: Six Lectures on Music given at Harvard,” 1973. Click here to watch the full video of Bernstein’s lecture. Here we see the pythagorean Tetractys. Here we see the Tetragrammaton  in a triangle, adding up to the number 72, considered in esoteric Jewish tradition to numerically represent God . From Pike, Morals and Dogma. The Tetractys with Hebrew attributions (The Ineffable Name). David Roberts, Egyptian Landscape with a Distant View of the Pyramids, 1862, Berger Collection at Denver Art Museum. Music, James writes, was considered within the Egyptian system of knowledge as “the living practice of philosophy, i.e. the adjustment of human life into harmony with God, until the personal soul became identified with God, when it would hear and participate in the music of the spheres. It was therapeutic, and was used by the Egyptian priests in the cure of diseases.”  Reading this account of their ideas and rituals, one cannot help but notice striking similarities with those that Pythagoras proclaimed and practiced. Pythagorean doctrine can in fact be considered a creative combination of these pieces of sacred knowledge coming from the Egyptian, the Babylonian, and the Jewish traditions. Although no final statement can be made on this account, since there are not many documented testimonies left to prove this, many researchers cling to this version, and to us, it also seems intuitively right. Variations on the Pythagorean tetractys, with the four baic elements (Fire, Air, Water, Earth) in Robert Fludd’s (1574–1637) treatises. The Egyptian origin of the Pythagorean triangle and the so-called 47th problem of Euclid: Osiris (Ausar, 3, male: origin), Isis (Auset, 4, female: recipient), Horus (5, the perfected result). This triangle is the symbol of the Creative Logos. From Higgins, The Beginning of Masonry : 32. The three-headed serpent representing time (Chronos), fragment from the frontispiece of Franchino Gaffurio’s Practica musicae, 1496. As we can see, the number Three has been viewed since antiquity as a basic creative number for the whole being, and the art of music specifically. In the European tradition, this has been illustrated multiple times, one of the most famous examples being the depiction of the “system” of celestial harmony under the guidance of Apollo, with the three graces, nine muses, seven planets (plus the sphere of fixed stars as the 8th), eight tones, and four elements all engaged in a harmonious interplay, from the treatise Practica Musicae published in 1496 in Milan by the musician and theorist Franchino Gaffurio (Gaffori), friend of Leonardo da Vinci’s who even allegedly painted his portrait. Remarkably, throughout the whole system of celestial harmony there stretches a three-headed serpent representing time, but also possibly implying some deeper mysteries connected with the number three which I hope to explore in detail on a different occasion. But now, I would like to turn your attention to another illustration, stemming from a later period. It is the frontispiece of book I of the extremely influential treatise Musurgia universalis (Universal Musikmaking, 2 vols., 10 books), published in 1650 by the great Jesuit scholar and magus of the Renaissance era, Athanasius Kircher (1602–1680). (Holy, holy, holy is the LORD of hosts; the whole earth is full of his glory!). On the middle level, we see Musica reigning over the globe of our mundane world, holding the lyre of Apollo (Harmony) and the panpipes (Dionysian, orgiastic element), thus demonstrating the dual principle that lies in the base of the whole creation. Frontispiece from Liber I of Athanasius Kircher’s Musurgia Universalis, 1650. Engraved by Baronius of Rome after a drawing by John Paul Schor. 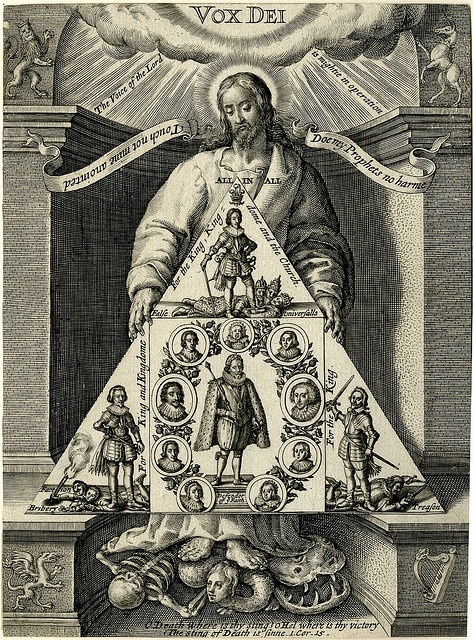 See also the frontispiece of his Arithmologia (1665) on numerical mysteries. In the lower left part of the image, we once again encounter the 47th problem of Euclid. Pointing at this sacred triangle, symbolizing the Trinitarian principle of the world on the mystical and mathematical levels (Isis, Osiris, Horus) by one hand, and at the “harmonious blacksmiths” by the other, alluding to the legend of how he discovered musical ratios, the ancient master is giving us a clue: the laws of mathematics and those of music-making are intrinsically related—in fact, they are one. Frontispiece of Kircher’s Musurgia Universalis, Liber I, fragment. The figure of the triangle underlies the whole complex fabric of music, not only on the level of string division, but also on that of the triads—those chords that best represent the principle of the Divine Trinity. It should be noted, however, that Griffith’s account of how music functions applies only to the ‘well-tempered’ system of Western (i.e. Christian) music that came about largely due to Andreas Werckmeister (17th c.) and J.S. Bach; in other musical cultures, for example in the East, there is often no need to resolve the sounds or chords into each other, for they all have the same melodic and harmonic value, and there is no strict division of sound material into concord and discord. Jerónimo Cósida, The Holy Trinity, fresco, c. 1570, Cisterian Monastery of Tulebras, Spain. But even before the introduction of this new system of musical coordinates that created a strict harmonious grid, composers and theologians had been fascinated by the idea and the sound of triad. Indeed, a precise meaning and visual representation of what the visionary saw that day can scarcely be found. 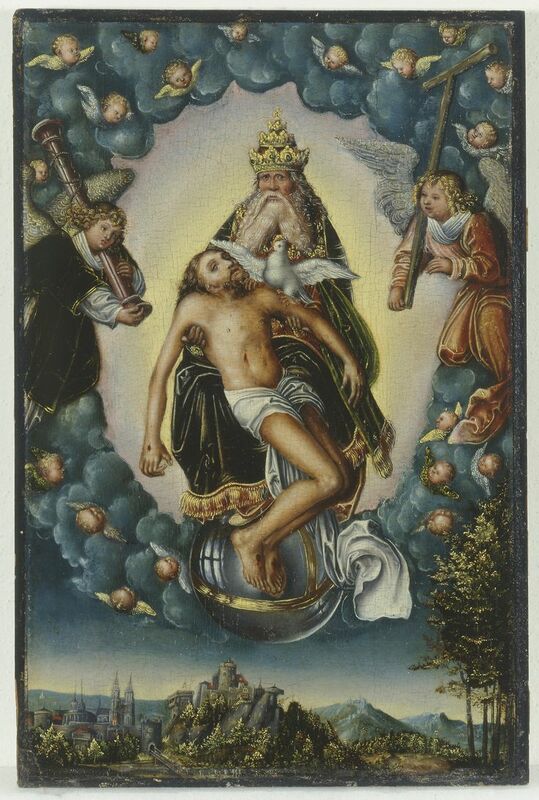 But there remains little doubt that what St. Ignatius wanted to convey was his perception of the Holy Trinity as a triad, sounding together in perfect harmony, but also actively producing divine overtones, thus expressing the concept of ‘motion in motionlessness’ which is often used to describe the ineffable essence of the Trinity. Or, as beautifully formulated by theologian Michael Peppard in his short essay on Ignatius’ unusual vision, St. Ignatius “heard the Trinity as a justly intoned musical triad, a relationship which through its harmony emanated other notes in a procession of audible light.”  This perception of sound as light and light as sound recalls the notion of synesthesia which has always been very important to mystics of various tradition as a manifestation of higher states of consciousness. A prominent specialist in Jewish studies, Aryeh Kaplan, calls synesthesia “an important experience in high meditative states, where sound is seen and colors are heard” and then gives an example of the illustrious Rabbi Akiva –the Jewish mystic often credited as the author of the present version of Sefer Yetsirah (Kabbalistic Book of Formation). On the Bible verse “And all the people saw the voices” (Exodus 20:15) Rabbi Akiva, who most likely lived through such experiences himself, elucidated “that they saw the sounds and heard visions, a clear example of synesthesia.”  The very possibility of such ecstatic states is yet another proof of the Pythagorean idea that the whole universe is governed by music that permeates all the levels of being. Access to this music can be attained in special elevated states of mind by those who are eager to develop a universal hearing within themselves, or just have it as a talent by virtue of birth, like Pythagoras. A depiction of “audible light,” or “luminous sound”: The Glorification of the Virgin by Geertgen tot Sint Jans, Museum Boijmans van Beuningen. Click here to listen to the musical instruments depicted in the painting. Live performance by Aaron Sheehan, Zachary Wilder, Matthew Anderson with Hank Heijink (theorbo), Daniel Swenberg (theorbo), and Avi Stein (chamber organ) for the Green Mountain Project on January 3, 2013 at the Church of St. Mary the Virgin, New York City. Plena est omnis terra gloria ejus. et hi tres unum sunt. Holy is the Lord God of Sabaoth. The whole earth is full of his glory. and these three are one. At first we here only two voices, as if vocally portraying the seraphim flying close to God’s throne, as they “cry to one another” (as in Isaiah’s vision of God: Is. 6:1-3 ff.) and sing their praise to the Supreme Lord: Sanctus Dominus Deus Sabaoth. As opposed to the original Bible text where this phrase contains the Tresanctus: ...et clamabant alter ad alterum et dicebant sanctus sanctus sanctus Dominus exercituum plena est omnis terra gloria eius (Biblia Sacra Vulgata), in Monteverdi’s piece the Sanctus is only sung once. The phrase‘Holy, Holy, Holy is the Lord God of Sabaoth’ from Isaiah 6:3 in Hebrew (Westminster Leningrad Codex): Kadosh Kadosh Kadosh Adonai Tz’vaot (written graphically as YHWH, the ineffable name of God). See Kedushah. Hildegard of Bingen, Laus Trinitati (Praise to the Trinity), performed by Letizia Butterin, 2014, Church of the Trinity, Verona, Italy. et que in omnibus vita est. and life within all things. To Hildegard, this vita is not specifically attached to any of the persons of the Holy Trinity: they all contain this ineffable life-force, streaming abundantly into our minds and onto our existence. 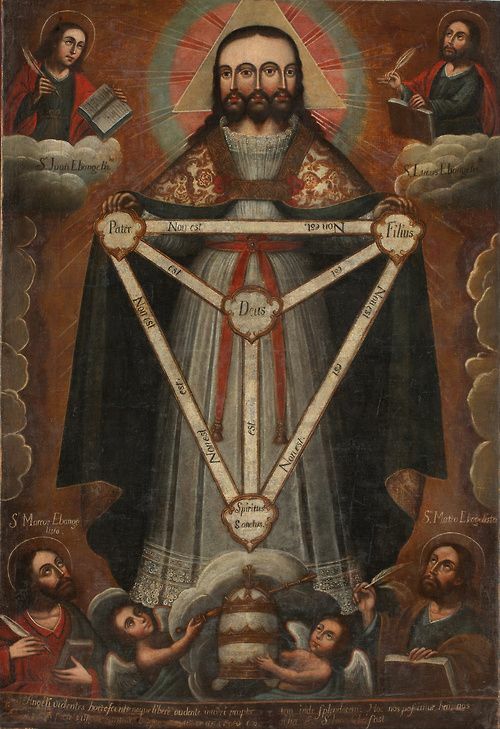 In the same way, in various works she associates sound with all the three Trinitarian aspects: in her book of mystical revelations, Scivias, the word’s sound (sonus) signifies the Father; in the hymn O ignee Spiritus, sound is connected to the Holy Spirit, and in her Liber Divinorum Operum, the term sonus often signifies the Son as the sound of the divine Word. Thus, to Hildegard, the two concepts, vita and sonus, appear as intrinsically connected, permeating all levels of being—and both streaming from all the three persons of the creative Trinity. Besides his other well-known merits, St. Augustine also wrote a six-book treatise De musica (387–391), where he discusses music as one of the liberal arts, emphasizing its ability to affect the human soul and, thus, human morals and behavior. To him, “recognition of the soul’s ability to judge according to harmonic principles is propaedeutic [instructive] to reflection on the soul’s ability to turn towards or away from God, and thus to be also rightly or wrongly ordered towards the creation.”  Moreover, he perceived musical composition as an act of participation in the Father’s creative activity, responding to the generative love of the life-giving Trinity. Angelic Choir (c. 1180). Hildegard of Bingen's illumination from Liber Scivias, Lucca, Biblioteca Statale. One of the composers of our times who at one critical time of his life directly used music and sound to improve his “psychological disposition” was the mysterious musical magus of the 20th century, the Italian count Giacinto Scelsi (1905–1988) whose 110th anniversary we are celebrating this year. It would not be a stretch to claim that he shared the belief of the composers of the past that the value of their work lies “primarily in its generative intention and in its intrinsic correspondence with the mystery it aimed at expressing,”  be it the mystery of Unity (monody, unison) or Trinity, although they are on some level one and the same. Signature of Giacinto Scelsi, reminiscent of Shen, Egyptian symbol of Infinity. Scelsi is known and admired especially for his explorations of the immense powers and possibilities of the unison, i.e. a single note, reflecting, among other implications, the monadic principle in the creation, and monody—a chant of one voice as opposed to choral singing. Born before the First World War, Scelsi suffered a mental breakdown after World War II. Apparently his gentle soul could not handle all the physical and spiritual atrocities of this massacre; in addition, as he himself claimed, he was made ill by the 12-tone music he had been involved with before, and needed a period of musical asceticism and purification. So he stopped composing for a few years altogether and resorted to the powerful remedy of sound vibrations. In 1952, he came out of this auditory isolation, inspired as ever. By 1959, he was able to compose a truly groundbreaking work for a chamber orchestra of 25 musicians, Four Pieces on a Single Note (Quattro pezzi su una nota sola), where each of the pieces centers on a certain pitch: F, B, A flat, and A. This composition is interesting to us in and of itself, due to its triple composition; but even more fascinating in the Trinitarian sense is the rendition of this piece made by the Voxnova Ensemble. Choosing to distribute the melody between three male voices singing in unison (Nicholas Isherwood/bass, Julian Pike/tenor, Pascal Sausy/baritone), the performers add a completely new spiritual dimension to this seemingly plain, but highly concentrated, even “condensed” music. In musical praise of the ineffable mystery, the singers, tuning horizontally to each other’s voices and spirits and vertically to the divine harmony, can mystically approach that supreme Triad and bring its auditory emanation to our hearing. Now we have heard three musical pieces from entirely different ages and contexts that allow us to approach the Sancta Sanctorum of the Trinitarian mystery, each from a specific angle. Combined, these three views are able to create a “tridimensional” image of the Trinity in our minds, in all its inexplicable magnificent glory—in a similar way as Olivier Messiaen creates a living image of Christ in his Twenty Gazes upon the Child Jesus. But this is of course only the peak of the enormous iceberg, or rather, the Holy Mountain which is the Trinity, and there’s much more to this mystery than the human mind can ever grasp. This is what we should always strive to, in spite of all of our incessant failures.